Henry Moore’s Warrior with Shield is neither standing nor fallen. His left arm and leg have been severed, rendering him unable to stand; however he is not yet defeated. The Warrior’s remaining arm thrusts a shield upward, as if to reflect a blow. 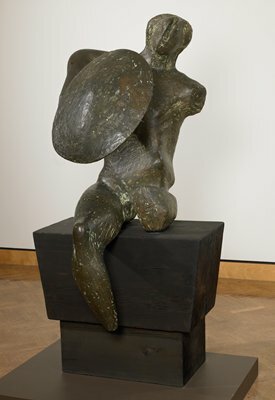 The scoring on the bronze surface of the sculpture is reminiscent of scars or wounds, and the jagged, uneven stumps where limbs used to extend help to portray a body under an extreme amount of pain and exertion. Moore’s Warrior reverberates with the agonies of a soldier’s brutalized, mutilated body yet with equal force shows the valor and persistence to fight to the end. The intimacy of the form of Warrior with Shield resonates with both the heroism and the tragedy of combat.